In July 2015 a group of ENTITLE fellows travelled to Palestine to attend the International Conference of Critical Geography in Ramallah. The following piece is the first part of a series on the political ecology of life under settler colonialism in the West Bank. 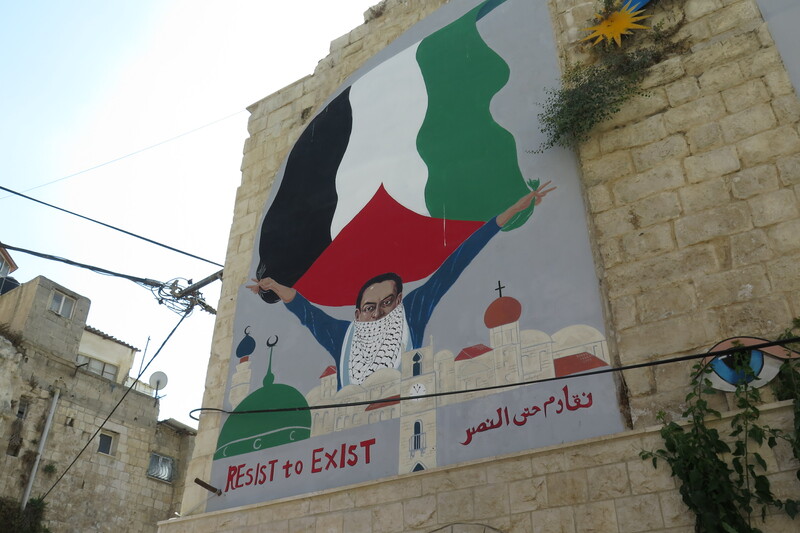 Mural in the West Bank city of Nablus. Photo by A. Huber. 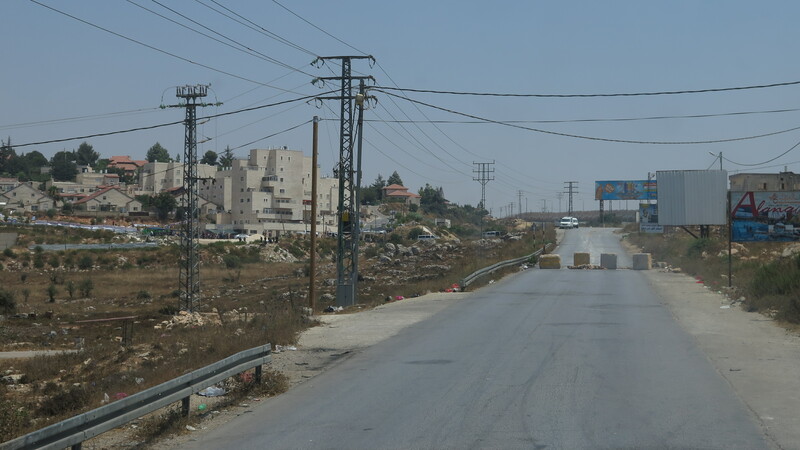 The International Conference of Critical Geography, which took place from 26-30th July 2015 in Ramallah was a superbly organised get-together of critical thinkers from over 40 countries and various academic and activists backgrounds. The programme was jam-packed with interesting panel sessions, plenaries, field trips and cultural events, and provided for a thought-provoking, transformative experience. Apart from the fact that at least 14 participants were denied entry by visa authorities and Israeli border controls, it was a surprisingly smooth event. Two afternoons of the four day conference were fieldtrips to cities and villages within the West Bank and in Israel. We as ENTITLE fellows also visited the Jordan Valley with our ENTITLE partner Nader Khateeb, who works with Friends of the Earth Middle East in Bethlehem. Overwhelmed with impressions, observations and accounts of the everyday plight of Palestinians living under occupation, we decided to publish a series of posts about the political ecology of everyday life under settler colonialism in Palestine. While this post looks at aspects of mobility, land expropriation, contamination and settler-farmer conflicts, subsequent posts will pick up other issues, including agriculture and water access, infrastructure enclosures, urban occupation, gentrification and resistance. The information reproduced here emerged from conversations with activists, academics and NGO workers based in the West Bank. ‘Flying check post’ near the settlement of Beit El on the outskirts of Ramallah. Photo by A. Huber. The unpredictable rhythm with which roads are closed and opened or relocated is related to the creeping expansion of settlements. Unannounced housing demolitions and land confiscations for settlement expansion are a daily practice in the West Bank. As Atef Sa’d, the late journalist and leading member of the Jerusalem Legal and Human Rights Centre (JLHARC) explains, one day it is a Palestinian house or part of an entire village that is demolished, another day a tree or an orchard is cut. In this way the settlements keep growing steadily. This leaves home owners and their livelihoods in a permanent state of disorientation and insecurity. At times, years may pass before a demolition order previously given is actually executed. In other instances the Israeli authorities have also carried out unannounced but only partial demolitions. No doubt Palestinians attempt to resist the confiscation of their land and the demolition of their properties, including through litigation. Sometimes with success. But it is uncertain how effective this is in the long term, given the determination with which some settlers seek to advance the Zionist project, and the extent to which their pursuit is backed by the Israeli authorities. In the settlement of ‘Beit El’, for example, we become witness to the demolition of two Israeli buildings. Established on the outskirts of Ramallah, the Palestinian private land on which Beit El is located was seized initially by the army for military purposes. Many buildings were built without permits, and are therefore illegal. But this is not necessarily an obstacle for construction. There is now a draft law in place to legalize such land confiscations retroactively, we are told. Alternatively, as in the case of Beit El, the demolition notice issued by the Israeli government for two buildings under fierce opposition of pro-settler parties is followed with a concession for hundreds more. 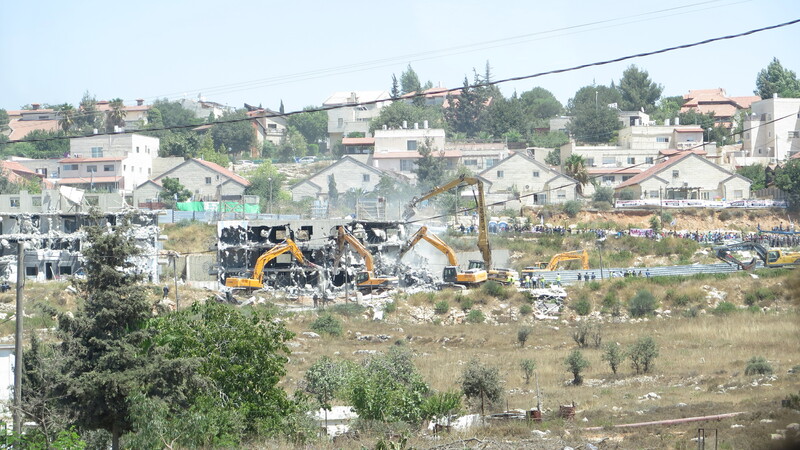 Bulldozers destroy two illegal Israeli buildings in the settlement Beit El. Israeli prime minister Binyamin Netanyahu has promised the construction of hundreds more. Photo by A. Huber. The example of Wadi Qana may be one of the most striking examples of Palestinian suffering due to land confiscation and settler colonialism. Wadi Qana is a river valley southwest of the strategic historic city of Nablus, which used to be particularly fertile for cultivation. Seventeen permanent springs supply water in an otherwise arid and rocky landscape. Most of the land in the valley is owned by around 50 families from the Palestinian village of Deir Istiya, who used to depend on the land and its springs for cultivation of vegetables and citrus, and for rearing cattle. 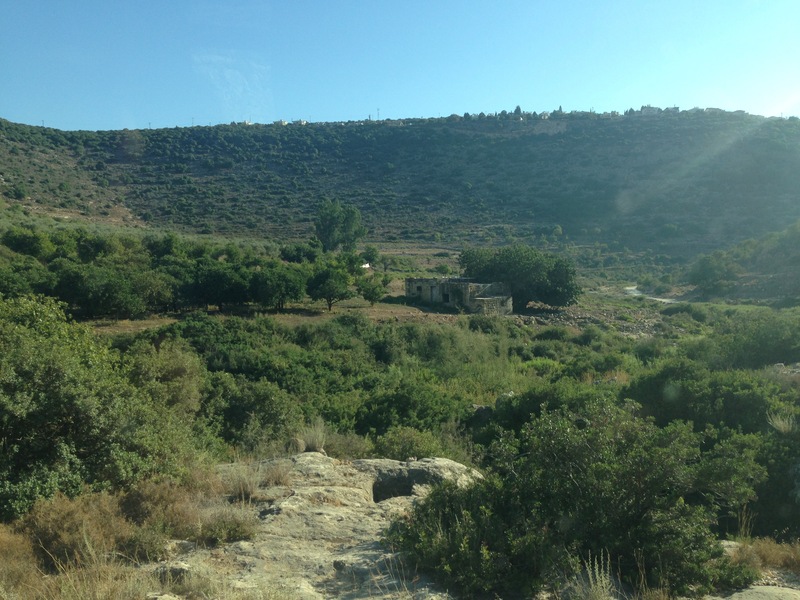 In 1979 the Israeli military attempted to declare Wadi Qana a closed military zone, an order which was later repealed due to resistance by the local villagers. Nevertheless, Wadi Qana was enclosed by settlements. The first, Qarne Shomron, was established in 1976, and has been joined by nine other settlements and settlement outposts. Together with the newly built road network they surround Wadi Qana and practically cut off the farmers’ direct access to their land. The enclosure creates other conflicts too. In 1983, an area of 1,400 ha land in Wadi Qana was declared a nature reserve. Despite this declaration the settlements and outposts discharge their wastewater into the valley, polluting the landscape, springs and streams. The first wastewater treatment facility was installed in 1992, but remained defective for most of the time. The sewage would percolate into the valley and damage the fields and ecosystem below, a condition which persists to date. Similar problems with sewage treatment and evacuation are reported elsewhere in the West Bank. In Ariel, the largest hilltop settlement of the West Bank, the sewage networks tend to overflow in the winter, leading to flooding of fields and homes in the village of Marda below. 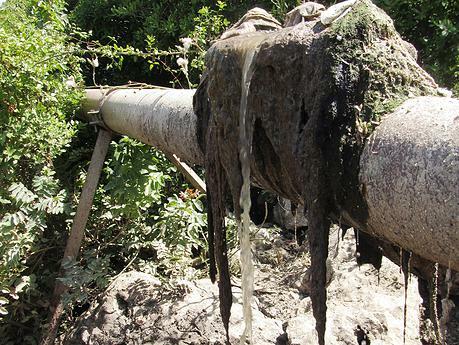 In industrial settlements the uncontrolled discharge of sewage also includes chemical waste. Solutions to the sewage problem through the establishment of wastewater treatment plants have been discussed in the Joint Water Committee, a body composed of Israeli and Palestinian water experts, who decide on water infrastructure plans in the West Bank. Money for such facilities has also been pledged from international donors. Yet, the problem appears to be foremost a political one. Since Israel has the veto power to refuse the building permits, it insists to have also the settlements connected to the water treatment infrastructure. The Palestinian Authority refuses this deal. Leaking sewage from Nofim settlement. Photo credit: http://www.wadiqana.wix.com. The roads that cut across the valley make it increasingly difficult and dangerous for farmers to move with their cattle and crops between farm land and village. Cattle deaths and human casualties due to road accidents are not unusual. The recent introduction of wild pigs has caused further losses in agricultural productivity, as farmers have no means to protect their land and crops from the animals. Many farmers no longer cultivate their land. The production of wheat has been almost completely decimated, taking away an important source of income. Tree nurseries for figs or almonds are also at risk. To top it all off, the valley does not receive any water or electricity supply, making life there practically impossible. Today only three families live in Wadi Qana with their animals. Another problem that puts at risk the livelihoods and food security of Palestinian farmers is that farmland located in or near the buffer zones around the settlements becomes practically useless: due to the securitization of the settlements, farmers approaching the buffer zones risk being fired at. Wadi Qana nature reserve. Photo by Melissa Garcia Lamarca. The restrictions on and enclosures of mobility, land and agricultural livelihoods illustrated above reveal how settler colonialism combines direct violence with the occupation of territory, infrastructure, resources and people. Life under settler colonialism thus becomes difficult and at times impossible for Palestinians. The political objectives of this kind of occupation appear obvious when looked at from a geopolitical perspective. The Zionist settlement project, which aims at the creation of a Greater Israel is premised on the impossibility of a continuous Palestinian state. Nowhere is this more visible than in the Salfit area, where more than 50% of the land has been confiscated already, or around Jerusalem. In both areas settlements are expanding to form a homogenous occupied area that extends to the Jordan Valley and the Dead Sea respectively, thereby separating the Northern and the Southern West Bank. The first series of about 130 settlements and 99 unauthorised outposts in the West Bank were built after the Six Day War in 1967, when Israel captured the West Bank and other territories. A movement of religious Zionists started venturing into the occupied territories and started construction, inspired by an ideology that urged them to ‘prepare the Holy Land’ and return it to Israel for the arrival of the Messiah. Approximately 700,000 Israelis subscribe to this ideology today, less than 10% of Israel’s population. The construction and expansion of settlements implies the expropriation of Palestinians from their homes, villages and farmland. *This is the first part of a series on experiences of several ENTITLE fellows during the International Conference of Critical Geography in Palestine. Subsequent contributions can be found here and here.